Myrtle Beach is a great place to visit, as millions of tourists who travel here each year already know. But even better than visiting on a week's vacation is living here year-round. Becoming a Myrtle Beach local and owning real estate in Myrtle Beach is like being on vacation every day of the year, expecially if you're able to buy one of the luxury condos, oceanfront homes, golf course villas, or waterway condos with breath-taking views of the Atlantic Ocean or the Intracoastal Waterway. 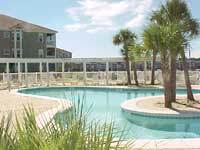 Finding real estate in Myrtle Beach is an easy matter. We have a thriving real estate market, with a variety of residential property that meet the needs of people from all walks of life. From the most humble single bedroom condos to the most lavish 6-bedroom oceanfront villas, real estate in Myrtle Beach covers every niche of the housing market. If you're serious about investing in the local real estate market, or if you're wanting to relocate here and become a permanent resident, we encourage you to contact the helpful and knowledgeable folks at Elliott Realty, who will help you find the best deals on North Myrtle Beach Real Estate. Elliott Realty has been in business on the Grand Strand since 1959, serving its customers with decades of knowledge and experience. Below you will also find many of the real estate companies in our local area. The Grand Strand of South Carolina is both a top-rated destination for family and group vacations as well as one of the best areas for property investments. You can find property overlooking the blue Atlantic Ocean, or find investment condos with waterway views, or live near one of the serene golf courses and work on your game while enjoying your retirement. Wherever you choose to live or invest, you'll find that now is an excellent time to purchase property on the Grand Strand.